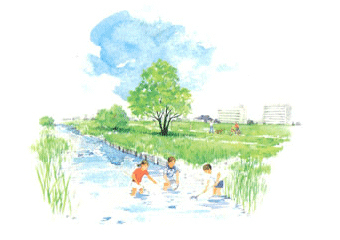 Our mission is to restore natural waterways and make them clean enough for children to play. We develop onsite wastewater treatment technology. We aim to be the no 1 company in this field in the world. In order to fulfil this mission, we focus on a natural self-cleaning process, making use of the natural power of microorganisms which is excellent for energy conservation. The largest volume of waste water comes from daily household use and we place the greatest Importance on this and the technology can be expanded to treat industrial organic wastewater as well. Pollution is not the only problem facing water supply. Many people in this world suffer from water shortage . Our technology can ameliorate the situation by providing various water recycling processes. By carrying out this mission, Fuji Clean will become a company whose value is recognized and applauded throughout the world. The ultimate goal of a company is to provide something the world needs while continuing to make a profit. The employees of Fuji Clean proudly pursue this task and receive rewards according to our contributions. Fuji Clean is a company that shares its output harmoniously with its employees and with a society as whole.